The man Business Week calls 'the ultimate entrepreneur for the Information Age' explains 'Permission Marketing' -- the groundbreaking concept that enables marketers to shape their message so that consumers will willingly accept it. * Does every single marketing effort you create encourage a learning relationship with your customers? Does it invite customers to 'raise their hands' and start communicating? * Do you have a permission database? Do you track the number of people who have given you permission to communicate with them? * If consumers gave you permission to talk to them, would you have anything to say? Have you developed a marketing curriculum to teach people about your products? * Once people become customers, do you work to deepen your permission to communicate with those people? And in numerous informative case studies, including American Airlines frequent-flier program, Amazon.com, and Yahoo!, Godin demonstrates how marketers are already profiting from this key new approach in all forms of media. Overall, most of the information in this book has been out in the business literature landscape for several years. It's pretty dated, and the reading is hardly what you call high energy. There are better business listens out there, but if you're bound and determined to develop a permission-based marketing campaign, muddle through it. 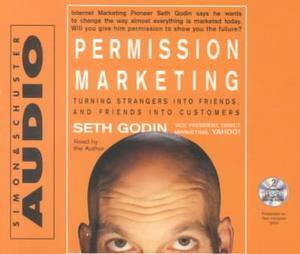 I first heard Seth Godin speak on permission marketing on a Google video (talking to Google employees) and had high hopes for this book. After reading 60% of this book (that as far as I could make it) he just another marketer out of touch with the consumer (ok, maybe less out of touch then the most marketers). I should mention this normally a topic I despise so maybe I am a little biased. Excellent analysis of how to more effectively "ask permission" to potential customers. I never thought of how many different ways there was to actually get a "slam dunk" sale! Seth really explains, in detail, how most of the most effective marketing today is "permission" based...that is....we ask for it! We actually want to be sold to...as long as it is what we want, or need. But what really is a "need?" Isn't it really what the marketers create as a "necessity" to "make our lives easier, more fulfilled, etc...?" Again, this really is a great realization of how to effectively market products, ideas, and create a movement. A good refresher on word-of-mouth, loyalty, and viral campaigns but, as noted, it does feel like dated and somewhat second nature by now. Would love to hear a revised version or addendum based on strategies and tactics that have worked via the Internet in the last five years. Seth Godin always has some good points. This book continues the trend, although it is a bit dated now. I can't fault the book for times changing, but a lot of the concepts he presents are somewhat commonplace now. It is interesting, though, to see the reasoning behind the way things are done. While the topic of permission marketing is one every marketer should understand, you can get alot of this on the Internet. Nothing really new here. He does cover the topic well. I was told how GREAT this guy was, so maybe my expectations were too high, but the book barely held my attention. This is a good book for anyone in marketing that is responsible for lead generation or maintaining an account base. The examples are a bit dated (many from 1999-2000), but the points made are timeless and especially relevant in today's Internet-based marketing. I've already recommended it to several of my colleagues. I think that although the information in this audio was nothing new, it reemphasized the fact that you shouldn't spam 10 million emails in hopes to play the "numbers game". You will be better off finding and keeping valuable customers through permission marketing then to waster money on buying lists and trying to sell to people who aren't interested...or to get the one-time sale.